Did you buy a new car? Do you have a car you’ve owned for a while? If Yes, then it is very probable that you need a new or you need an upgrade of the car’s speakers and audio systems. All of us know that most cars do not have good quality speakers already installed when you buy them. Car manufacturers prefer it this way because it cuts down on production costs and increases amount of sales. Most people prefer to upgrade to component speakers; you should too as so as not to be left out of this practice. The reason is that component speakers produces high-quality sound. Who would not like to have such anyway? With the best component speakers, you get clear, undistorted music. The kind of stuff you would want to show off to your friends. When you want to replace your current speakers, finding the right kind of component speakers is the tricky part. Every system has lots of confusing features such that you would not know which is which. If you by any chance make the wrong choice, you will end up with the same shrill, harsh sound you wanted to replace in the first place. This review will make choosing a component speaker much easier and make you the darling of the neighbourhood in matters music. Different manufacturers produce varying speakers of different capabilities and properties. Some try to minimise their production costs, by using low-quality products, no offense though. These are always the cheapest. While others have the customer at heart and produce the best qualities they can although you will have to spend more money. Whichever the case, you should look for component speakers that meet your specifications, balancing between price and quality. And if money is a non-issue, then go for the best quality there is. Here are some of the features that you should check out in a component speaker before you buy it. This is one of the most important features but mostly ignored by buyers. A speaker’s sensitivity measures its loudness and is measured in decibels (dB). A louder speaker will have a higher sensitivity value and vice versa. Average speakers have sensitivities of around 88 dB. Therefore, the ones with sensitivity ratings of over 90 dB will be very good options to choose from. How sensitive a speaker is will depend on the power it will be able to handle. Highly sensitive speakers have higher efficiency in handling the power it is given. This means that when you have low power being fed to the audio system, then you want a highly sensitive speaker. The reverse is also true. Lowly sensitive speakers will be able to handle the high power connected to it. This is the measurement that manufactures give to the produced speaker, as an indication of the amount of power the speaker will be able to operate at optimally. It is given in watts. 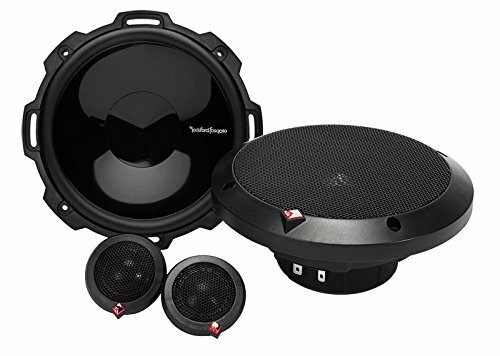 The power rating determines the range at which the speaker will operate before getting damaged. Power handling can be given in two ways, RMS and Peak. RMS refers to the continuous power that a speaker is able to withstand before getting damaged. The Peak power rating is the highest(max) amount of power the speaker bears at an instant. When deciding on a component speaker, only consider the RMS power rating as it is more relevant. The ratings can somehow be confusing, whether it is Peak or RMS. Look and ensure that the rating is indeed in RMS before you buy the speaker. Any sound produced by any speaker will consist of some level of noise in it. The only difference is the magnitude of the noise in comparison with the signal input give to the speaker. As the speaker converts the audio signals to sound, the movements of the internal components add up to an output signal in the form of noise. Let us take an example of an SNR rating of 100 dB; this means that the audio signal strength is 100 dB higher than the noise levels. When settling on a speaker of your choice, look for one with the highest Sound to Noise Ratio. This is an indication of the frequencies that the speaker can still produce sound at and is indicated in Hz. It is how high and low or high a component speaker can play. The range is given in XHz-XkHz. To better understand what this rating means, let us take a hypothetical rating of 70Hz-10kHz. The first figure of 70Hz indicates the bass output of the speaker. The bass becomes deeper as this number reduces. The 10kHz is a representation of the highest level of treble the speaker can play. Choose speakers that can reach at most 50Hz or lower as it is considered a better option. Impedance refers to the level of resistance the speaker offers. It is measured in ohms. It is the resistance offered to the flow of current in the speaker during signal conversion. A higher impedance results in the current flowing through the speaker and vice versa. Now you are asking yourself which is which? Choose a speaker with the right balance between the impedance, not too high or too low. Higher impedance means less current flows, hence low volumes. Low impedance means more current flows, putting more strain on the system. The amplifier may at times not be able to handle the excess current flow. Generally, look for component speakers of optimum ratings and be sure to enjoy some smooth, good music. Here are some five products found in the market you should consider buying. Like your music loud? The Alpine SPS 610 is designed for those of you who like to turn it up. This speaker delivers quality audio as you cruise around town. Its frame is made from high-density polymers to eliminate any distortions. Another exceptional feature is its flexibility and ease of installation. It can be installed at any point you want. It is of the S-type speakers known for their heavy deep notes for crisp sounds that do not vibrate the whole car. The cone woofer is made of butyl rubber to last longer. The subwoofers can also be connected to your car’s audio amplifiers to better the quality of sound. The tweeter’s dome is made from soft silk diaphragm coupled with a rigid aluminum structure to generate higher resolutions. A copper pole reduces the so-called intermodulation distortions for clearer sounds. All these are rolled into one set that generates high-quality sounds so you can enjoy that favorite song. Measures 4 x 6 x 3 inches. The Polk Audio DB6501 delivers superior quality sound at the turn of your car keys. It combines high performance with power to deliver reliable and optimized sound each and every time. It works with high-end units with factory installations. The sound is clear in both highs and lows, eliminating distortion in the process. These speakers are made from stainless steel for mounting, butyl rubber together with a rust proof steel basket for longer service life. The depth, clarity and quality of sounds is much better than the default audio systems the cars come with. There is an added special feature to this speaker. It is waterproof so that you do not have to worry about wetting it as you wash your car. These speakers are well known for their great soundstage effect. 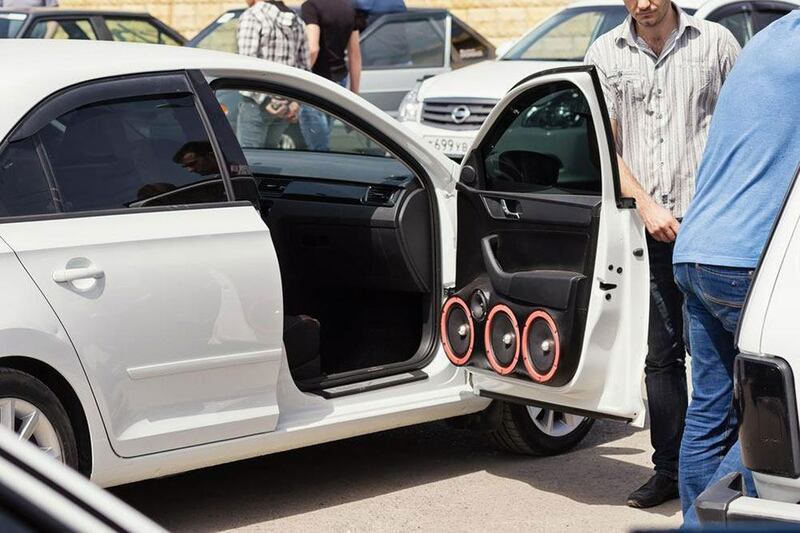 Maximize this effect by placing the speakers on either side of the car and enjoy yourself. With the Polk Audio, you are likely to spend more time in the car listening to your favorite jazz or high base tunes. 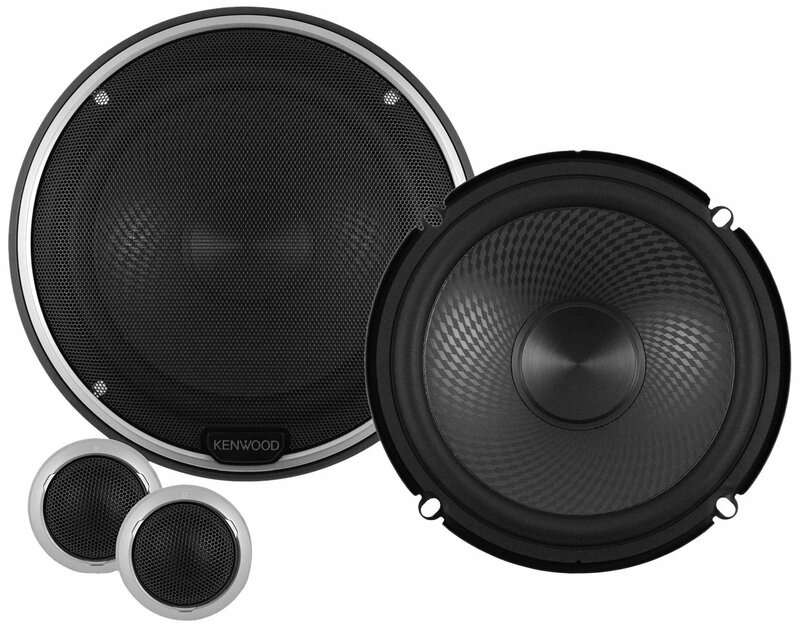 Kenwood is a company to reckon with in the production of high quality speakers. They have maintained their legacy again by building the high quality Kenwood KFC speakers that produce the best sound ever. 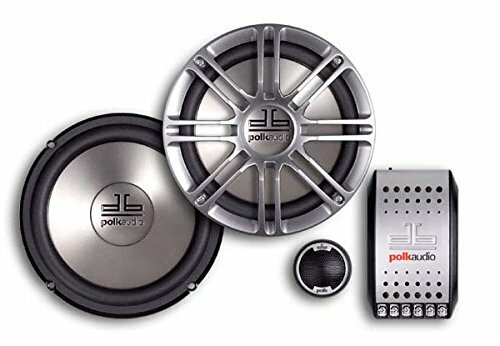 When you have these speakers in your car, it is almost a sure bet that you are going to enjoy your moments in the car. With a peak input power of 280W, these speakers are so powerful and deliver just what you are looking for. They are 6.5 inch component speakers and feature an injected polypropylene cone having a diamond array pattern for even better quality. What’s more, these speakers also feature an advanced crossover network that makes them stand out in their class. With a 1 inch swivel tweeter, the quality of the sound produced by these speakers can’t get any better. 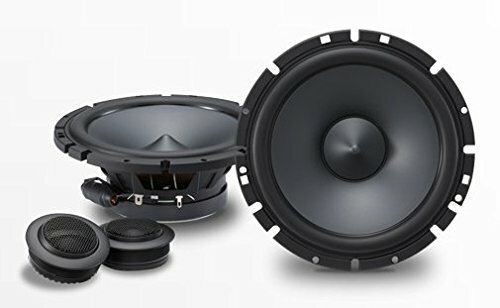 If you are looking for quality music in your car then you need to look no further than the Kenwood Kfc component speakers. 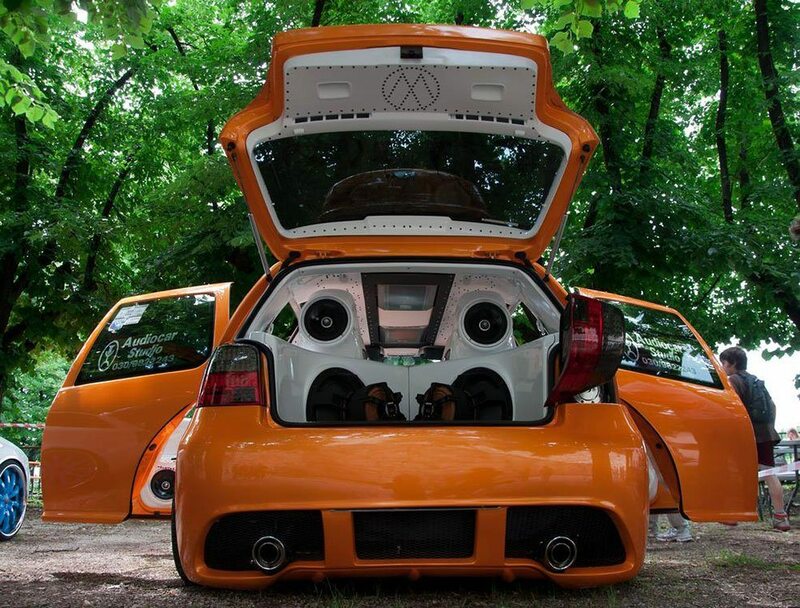 We just love quality sounds in our cars. What we even love more is doing so at the minimum costs. The Rockford Fosgate is designed just for this. Fantastic sound quality at great prices. These speakers are available in various sizes for all your needs. These speakers are fabulously manufactured by choosing only the highest quality materials. They produce better sound quality than the previous ones. If you have an earlier version, you may consider upgrading to these latest speakers. The price too is very great. You do have to spend a fortune to install quality sound systems in your car (s). These speakers have a polypropylene cone which produces “punchy” sounds with fast transitions between notes. It has a rubber speaker surround to facilitate linearity of movements while allowing for excursion better than other speakers. The Rockford Fosgate P1675 is pleasing, performs solidly, and is always ready to deliver quality sounds for memorable listening experiences. When you connect this speaker to the right amplifier, what you get is very spectacular sounds. It can handle 60 watts of power. When you love high integrity sound, you can reproduce it on any seat as the speakers have 2-way transducers. There is another superb feature that you can enjoy with these speakers. The 89dB sensitivity permits the generation of any desired volume levels. The components are made from high-quality materials that are able to withstand the high volumes permitted. This speaker meets CEA-2031 specification standards. Cruising around town can be very dull at times, more so when you are solo in your car. No friends to talk to, just you, the car and the road. This calls for the need to have quality best component speakers in your car. Even choosing the right speakers may be a problem, we have made the task quite easy for you. This review has outlined five of the best products in the market. And just like in many cases, one of the five has to stand tall above the rest. 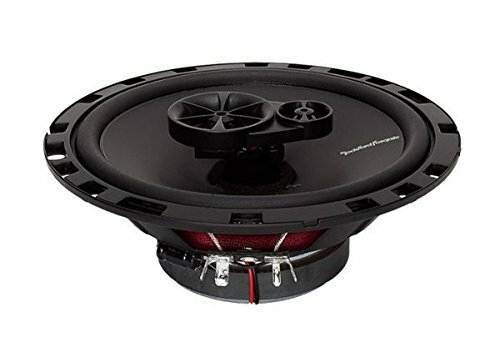 The Rockford Fosgate R165X3 Prime 6.5-Inch Full-Range 3-Way Coa﻿﻿xial Speake﻿﻿r leads this pack of five. It has a rich bass for your needs and high sensitivity to handle any power provisions for your happy listening.